The rain- and snow-bursts are not caused by emissions from the aircraft but are the peculiar consequence of the aircrafts' wings passing though clouds of supercooled water droplets in cloud layers above a layer of active rain or snow. "The interesting thing about this feature is that it is caused by aircraft, but it is not caused by pollution," said Dimitri Moisseev, a researcher at the University of Helsinki and the Finnish Meteorological Institute and the lead author of the new study in AGU's Journal of Geophysical Research: Atmospheres. "Even if there would be absolutely ecological airplanes, which don't have any combustion, no fuel or anything, it would still happen." Although the bands of enhanced precipitation are artificially created, the physical process jump-started by the passage of planes can occur naturally, which makes them useful laboratories for studying the formation of precipitation, according to Moisseev. Observing them may help meteorologists "nowcast" natural rain and snow conditions 2 to 6 hours into the future, which is essential for airport operations. "When you, like myself, look at the radar data every day there is always something interesting going on," Moisseev said. "Surprisingly enough, there's always new things that we cannot explain still." Their shapes looked intriguingly like the inverse of cloud formations known as fallstreaks, hole-punch or canal clouds, phenomena which can occur when aircraft fly through clouds of water droplets that are colder than 0 degrees Celsius (32 degrees Fahrenheit) —but aren't freezing. 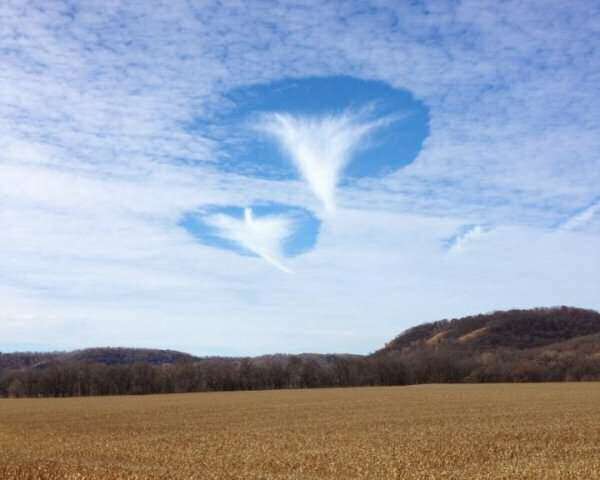 “Hole-punch” clouds like this one seen over Houston, Minnesota in November, 2014, occur when airplanes fly through a thin cloud of supercooled water vapor, causing water droplets to freeze. The tiny crystals fall, leaving a hole to mark the plane’s passage. When such supercooled clouds overlay a lower layer of precipitation, the falling crystals can instigate intensified rain or snowfall, according to a new study in AGU’s Journal of Geophysical Research: Atmospheres. Credit: Jamie Vix. Andrew Heymsfield, a senior scientist at the National Center for Atmospheric Research's Mesoscale and Microscale Meteorology Laboratory in Boulder, Colorado, and a researcher unaffiliated with the new study, had noted the potential for inadvertent seeding of supercooled clouds over airports in a previous paper about the formation and spread of aircraft-induced holes in clouds. He observed similar arcs of heightened snowfall in radar data collected near Denver, Colorado's former Stapleton Airport in 1992. "We know that planes can trigger precipitation. The authors of this study have a lot of cases, with wonderful data from ground-based instruments—radar, lidar—good information about particle size and concentration, and radiosonde data to show the likely temperature for formation," Heymsfield said. "They succeeded in documenting the phenomenon." 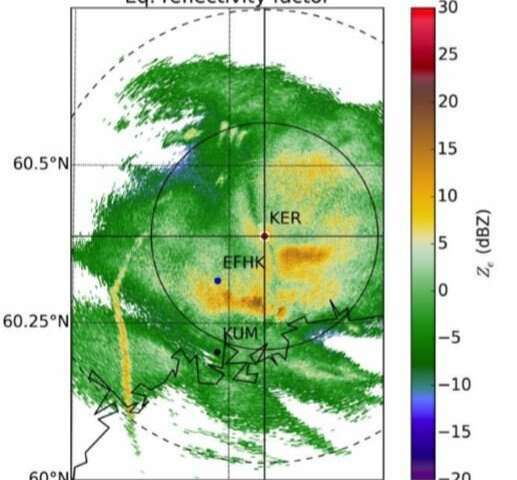 To find out if the streamers of heightened precipitation could be caused by aircraft, Moisseev and his colleagues reviewed 11 years of the University of Helsinki's weather radar data and found 17 days with repeat cases of the characteristic linear streamers between December 2008 and January 2018. "The intensified precipitation basically follows the track of an airplane above the cloud," Moisseev said. "It could extend over hundreds of kilometers, but the cross-section would be maybe 100 meters. So it's a very narrow, long feature."